During the period November 19 to 24, VINLEC is hosting a series of activities to commemorate the 25th anniversary of the Cumberland Hydro Power Station and the 50th anniversary of the Richmond Hydro Power Station. Electricity production at Richmond commenced in 1962, while electricity production at Cumberland started in 1987. 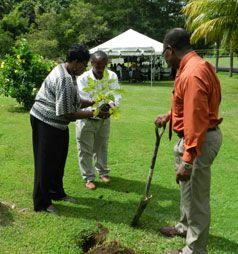 The celebratory activities began on Monday 19 with an opening and tree planting ceremony at Cumberland. The event was attended by Chairman of VINLECâs Board of Directors â Rene Baptiste, Chief Executive Officer of VINLEC â Thornley Myers, members of staff and other guests including retirees and past employees at both locations. Addressing the gathering, CEO Myers noted that VINLEC has been utilizing a renewable resource for energy production as far back as 1953, when the South Rivers Power Plant was commissioned. Myers noted that with the introduction of the hydro plants, rural areas of the country were electrified. He says with the production of electricity at the hydro power plants this country utilizes less fuel for the generation of electricity. According to Myers, during 2011 both Richmond and Cumberland recorded the highest production in the history of operations saving this country 14 million EC dollars on fuel importation. He further noted that 2011 was the best production year for the hydro plants. Myers said that the company continues to focus on renewable energy and that during 2013 work to refurbish the Richmond and South Rivers Stations will commence. He also announced that VINLEC will be involved in a solar project which will see the installation of photovoltaic panels at several schools across the country. These panels will have the capacity to generate 500 kW of electric power utilizing the sun. The project will be the largest of its kind in the Eastern Caribbean and is estimated to cost 3.5 million EC dollars. Meanwhile, residents of North Leeward were engaged in discussion with representatives from VINLEC at a community meeting on Tuesday, 20 November. The meeting, which was held at the Spring Village Methodist School, heard briefly from the Companyâs CEO and manager, customer services – Steve Wyllie. The attendees were given the opportunity to speak to the companyâs representatives on matters relating to VINLEC. Among the issues addressed was the composition of the electricity bill, damage to VINLECâs infrastructure and legal implications, and VINLECâs social responsibility, among others. The community members expressed satisfaction with the outcome and indicated that they had a better appreciation of how the company functions. They noted that the format of the session proved beneficial to all present. The activities continued on Thursday, November 22 when Grade 6 students from the six primary schools in North Leeward visited both locations. This tour sought to educate the participants about the role and function of VINLEC and show how electricity is generated at the plant. The Richmond Hydro Station accounts for approximately five per cent of the annual production, while an average of 10 per cent of the electricity generated in St Vincent and the Grenadines is produced at Cumberland.